On June 1 2016, IPOPI attended the meeting of the European Parliament’s Interest Group on Innovation and Health and Social Care in which Health First Europe actively participates. Five policy recommendations addressed to the European Commission and EU Member States on how to translate innovation into national healthcare systems were launched. To achieve this aim, the work of the Interest Group was supported by the participation of Mr. Sylvain Giraud, Head of Unit for Performance of National Health Systems at DG-Santé, and Prof. Walter Ricciardi, Member of the Expert Panel on effective ways of investing in health. 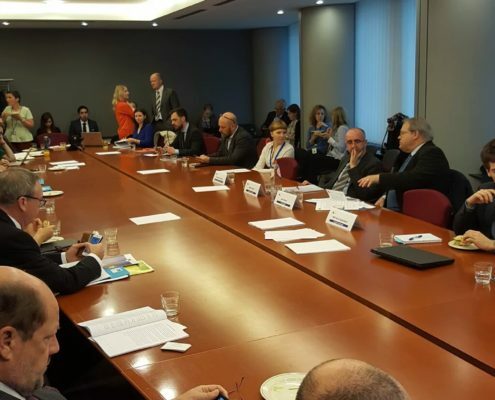 The interest Group with the support of its Co-chairs MEP Karin Kadenbach (S&D, AT) and MEP Marian Harkin (ALDE, IE) has been working to define and showcase the role of innovation to improve patient lives since its launch in November 2014. Ms Kadenbach insisted that it was necessary to work together between European institutions and EU Member States to guarantee the strengthening and sustainability of national healthcare systems. Mr John Bowis, Health First Europe Honorary President, highlighted how any national reform should put the patient at the centre and focus on better use of resources. In his opinion European stakeholders “need to work more and together to provide European citizens with the best quality healthcare, taking full advantage of the new technological innovations in the sector without compromising the healthcare national budgets”. To make patients beneficiary of innovative healthcare solutions “It is essential to have innovative reforms” Mr Sylvain Giraud stated. His contribution emphasised the tension between innovation and budgetary restraints. Nevertheless, patients expect cost-effective innovation as Mr Giraud said “It is not only about new technologies and new products, but it is also about new structures, new delivery model, new processes, new services, new financial mechanisms, new pricing mechanisms, and also workforce skills. What we need is a mix of all these innovative elements”. Bearing in mind the European Union competencies in the health policy, the European Commission is currently supporting Member States to look for new ways to deliver new treatments and technologies or other types of innovative solutions to meet patient expectations. Mr Johan Prévot highlighted “the need to have a macro-economic approach to the assessment of innovative treatments and technologies when it comes to rare diseases such as primary immunodeficiencies and include the impact these innovations will have in terms of socio-economic and quality of life aspects for patients“. He further stressed the necessity to identify new ways of assessing such aspects through validated tools and mentioned IPOPI’s current survey that uses the Burden of Treatment methodology with the ultimate goal to develop a PID specific validated tool. The meeting’s conclusions answered the basic question of “How can we translate innovation into policy recommendations?” Key suggestions included access to proper insurance for all citizens, enhancing patient role in the healthcare reforms, sharing best practices, investing in training on the healthcare workforce. Bearing in mind the critic role of innovation in improving patient lives, it is necessary to work together to motivate Member States to invest in cost-effective innovation.